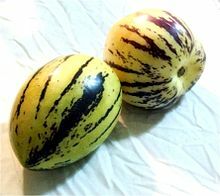 A small shrub that produces yellow fruit that is melon in flavour. The fruit is produced all year round. Full sun/ part shade. Must be protected from frost. Suitable for pots. Height to 1m.